Apple released a new flagship iPhone yesterday, the iPhone XS. This isn’t exactly ground-breaking news: it is exactly what the company has done for eleven years now (matching the 11-year run of non-iOS iPods, by the way1). To that end, what has always interested me more are new-to-the-world non-flagship models: the iPhone 5C in 2013, the iPhone 8 last year (or was it the iPhone X? ), and the iPhone XR yesterday. Each, I think, highlights critical junctions not only in how Apple thinks about the iPhone strategically, but also about how Apple thinks about itself. It’s hard to remember now, but the dominant Apple narrative in 2013, after a five-year iPhone run that saw the company’s stock price increase around 700%, was that the company was at risk of low-end disruption from Android and high-end saturation now that smartphone technology was “good enough”. This was, for me, rather fortuitous: Stratechery launched in the middle of the Apple-needs-a-cheap-iPhone era, providing plenty of fodder not only for articles defending Apple’s competitive position,2 but also multiple articles speculating on what the iPhone 5C would cost and how it would be positioned. For the record, I guessed wrong, and I knew I was wrong Two Minutes, Fifty-six Seconds into the keynote. It was at two minutes, fifty-six seconds that Tim Cook said there would be a video – a video! – about the iTunes Festival. No, we will NOT compete on price, we will offer something our competitors can’t match. No, we are NOT selling a phone, we are selling an experience. No, we will NOT be cheap, but we will be cool. No, you in the tech press and on Wall Street do NOT understand Apple, but we believe that normal people love us, love our products, and will continue to buy, start to buy, or aspire to buy. This attitude and emphasis on higher-order differentiation — the experience of using an iPhone — dominated the entire keynote and the presentation of features, with particularly emphasis throughout on the interplay between software and hardware. In fact, that understated Apple’s position in the market: as I discussed last year the iPhone 5C — which in retrospect, was really just an iPhone 5 replacement in Apple’s trickle-down approach to serving more price-sensitive customers — was a bit of a failure: Apple customers only wanted the best iPhone, and those that couldn’t afford the current flagship preferred a former flagship, not one that was “unapologetically plastic”. Thus the first lesson: Apple wouldn’t go down-market, nor did its customers want it to. Last year, meanwhile, was in many respects the opposite of the iPhone 5S and 5C launch, at least from a framing perspective. The iPhone 8 was the next in line after the iPhone 7 and all of the iPhones before it; it was the iPhone X that was presented as being out-of-band — “one more thing”, to use the company’s famous phrase. The iPhone X was the “future of the smartphone”, with a $999 price tag to match. This was the second lesson: for Apple’s best customers, price was no object. To be clear, the overall strategy and pricing of the iPhones XS and XR were planned out two to three years ago; that’s how long product cycles take when it comes to high-end smartphones. Perhaps that is why the lessons of the iPhone 5C seem so readily apparent in the iPhone XR in particular. First off, while the XR does not have stainless steel edges like the iPhones X or XS, it is a far cry from plastic: the back is glass, like the high end phones, and the aluminum sides not only look premium but will be hidden when the phone is in a case, as most will be. What really matters is that the front looks the same, with that notch: this looks like a high-end iPhone, with all of the status that implies. Second, the iPhone XR is big — bigger than the XS (and smaller than the XS Max, and yes, that is its real name). This matters less for 2018 and more for 2020 and beyond: presuming Apple follows its trickle-down strategy for serving more price-sensitive markets, that means in two years its lowest-end offering will not be a small phone that the vast majority of the market rejected years ago, particularly customers for whom their phone is their only computing device, but one that is far more attractive and useful for far more people. Third, that 2020 iPhone XR is going to be remarkably well-specced. Indeed, probably the biggest surprise from these announcements (well, other than the name “XS Max”) is just how good of a smartphone the XR is. The XR has Apple’s industry-leading A12 chip, which is so far ahead of the industry that it will still be competitive with the best Android smartphones in two years, and massively more powerful than lower-end phones. The XR has the same wide-angle camera as the XS, and the same iteration of Face ID. Both, again, are industry-leading and will be more than competitive two years from now. The biggest differences from the XS are the aforementioned case materials, an LCD screen, and the lack of 3D Touch. Again, though, aluminum is still a premium material, Apple’s LCD screens are — and yes there is a theme here — the best in the industry, and 3D Touch is a feature that is so fiddly and undiscoverable that one could make the case XR owners are actually better off. There really is no other way to put it: the XR is a fantastic phone, one that would be more than sufficient to maintain Apple’s position atop the industry were it the flagship. And yet, in the context of Apple’s strategy, it is best thought of as being quite literally ahead of its time. There is, of course, the question of cannibalism: if the XR is so great, why spend $250 more on an XS, or $350 more for the giant XS Max? This is where the iPhone X lesson matters. Last year’s iPhone 8 was a great phone too, with the same A11 processor as the iPhone X, a high quality LCD screen like the iPhone XR, and a premium aluminum-and-glass case (and 3D Touch!). It also had Touch ID and a more familiar interface, both arguably advantages in their own right, and the Plus size that so many people preferred. It didn’t matter: Apple’s best customers, not just those who buy an iPhone every year, but also those whose only two alternatives are “my current once-flagship iPhone” or “the new flagship iPhone” are motivated first-and-foremost by having the best; price is a secondary concern. That is why the iPhone X was the best-selling smartphone, and the iPhone 8 — which launched two months before the iPhone X — a footnote. To be sure, the iPhone X had the advantage of being something truly new, not just the hardware but also the accompanying software. It was the sort of phone an Apple fan might buy a year sooner than they had planned, or that someone more price sensitive might choose over a cheaper option. The XS will face headwinds in both regards: it is faster than the iPhone X, has a better camera, comes in gold — it’s an S-model, in other words — but it’s hard to see it pulling forward upgrades; it’s more likely natural XS buyers were pulled forward by the X. And, as noted above, the XR is a much more attractive alternative to the X than the 8 was to the X; most Apple fans may want the best, but some just want a deal, and the XR is a great one. To put it another way, to the extent the XR cannibalizes the XS, it cannibalizes them with an average selling price equal to Apple’s top-of-the-line iPhone from two years ago; the iPhone 8 is $50 higher than the former $550 price point as well. 2013 was a time of uncertainty, with a sliding stock price and a steadily building clamor heralding Apple doom via low-end disruption; the company, though, found its voice with the 5C and declared its intentions to be unapologetically high-end; the 5C’s failure, such that it was, only cemented the rightness of that decision. In 2017 the company, for the first time in ten years, started to truly test the price elasticity of demand for the iPhone: given its commitment to being the best, just how much could Apple charge for an iPhone X? This year, then, comes the fully-formed iPhone juggernaut: an even more expensive phone, with arguably one of the weaker feature-driven reasons-to-buy to date, but for the fact it is Apple’s newest, and best, iPhone. And below that, a cheaper iPhone XR that is nearly as good, but neatly segmented primarily by virtue of not being the best, yet close enough to be a force in the market for years to come. The strategy is, dare I say, bordering on over-confidence. Apple is raising prices on its best product even as that product’s relative differentiation from the company’s next best model is the smallest it has ever been. Here, though, I thought the keynote’s “Mission: Impossible”-themed opening really hit the mark: the reason why franchises rule Hollywood is their dependability. Sure, they cost a fortune to make and to market, but they are known quantities that sell all over the world — $735 million-to-date for the latest Tom Cruise thriller, to take a pertinent example. That is the iPhone: it is a franchise, the closest thing to a hardware annuity stream tech has ever seen. Some people buy an iPhone every year; some are on a two-year cycle; others wait for screens to crack, batteries to die, or apps to slow. 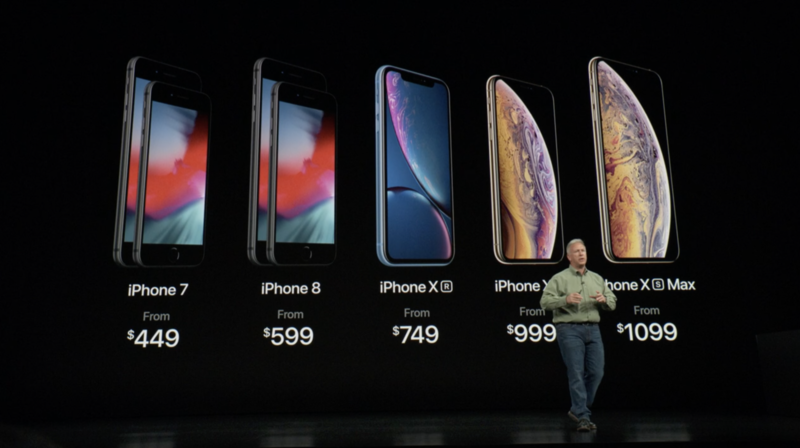 Nearly all, though, buy another iPhone, making the purpose of yesterday’s keynote less an exercise in selling a device and more a matter of informing self-selected segments which device they will ultimately buy, and for what price. I wrote a follow-up to this article in this Daily Update.